Piccolo was the evil half of Kami. Piccolo is a Namekian. Orginally King Piccolo or Piccolo Daminoh, he terrorized the Planet until Goku did a flying headbutt through his stomach. Piccolo Daminoh then preserved his essence into a egg, spit it out, and then died. The egg hatched the Piccolo we all know today. Piccolo was Goku's arch enemy until Raditz came and threatened the Earth. Piccolo was the one that killed Raditz and Goku. Piccolo also saw Gohan's hidden power and trained Gohan for a year to help fight the Saiya-jins, Vegeta and Nappa. Piccolo was killed by Nappa, but Piccolo recieved training in the afterlife along with Yamcha, Tenshinhan and Chaotsu from Kaiosama. 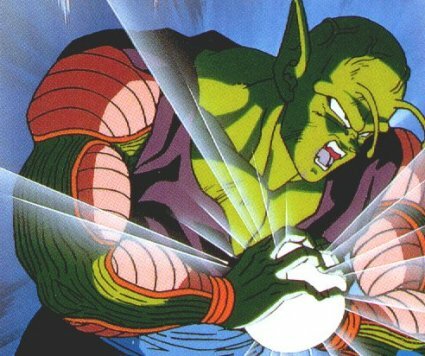 Piccolo was wished back to life by the Namekian Dragon Balls and was transported to Namek to help fight Freezer. Along the way Piccolo fused with another Namekian warrior Nail, and gained tremondous power. Piccolo took down Freezer in his second form, but was outmatched afterwards. 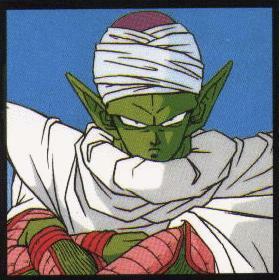 Piccolo now plays a smaller role in DBZ than he did originally, but still remains a good fighter. Piccolo's main attacks are, the Light of Death (Special Beam Cannon) and Macosan.